Tokyo, December 20, 2012 - Fuji Heavy Industries Ltd. (FHI), the maker of Subaru automobiles, today announced that it has started production of the Subaru XV crossover SUV at a Malaysian assembly plant of Tan Chong Motor Assemblies Sdn. Bhd (TCMA), an automotive assembly company of Tan Chong Group. The official ceremony to mark the production start was held at the TCMA plant on December 19. The attendees included honored guests from the Malaysian government including Y.B Dato' Mukhriz Tun Mahathir, Deputy Minister of Ministry of International Trade and Industry and representatives from FHI and Tan Chong Group as well as Subaru / Tan Chong team members of Subaru's CKD (Completely Knocked Down) production project. The CKD assembly of Subaru's popular crossover is conducted under contract by TCMA with the initial production plan of 5,300 units a year. 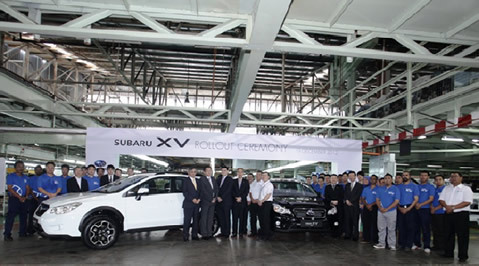 Locally-assembled Subaru XV models go on sale in Malaysia, Thailand and Indonesia through Tan Chong Group's well-established distribution channels. Since its foundation in 1974, TCMA has established its expertise in production and quality management in its long time engagement in automotive assembly of Japanese and European brand automobiles including Subaru vehicles back in 1986. The pre-production model of TCMA-made Subaru XV showcased at the Indonesia International Motor Show in September this year has received excellent reviews on its production quality as well as the vehicle's sleek, yet muscular styling. With the successful launch of its local production as a milestone, Subaru has made a good step forward on its commitment to sales expansion in the growing ASEAN markets.